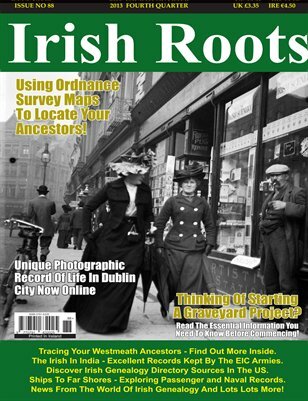 Irish Roots magazine is a genealogy and family history magazine dedicated entirely to Irish ancestral research available in both print and digital format. Irish Roots magazine is a celebration of Irish ancestry, heritage, culture and traditions! In this issue: Using Ordnance Survey Maps To Locate Your Ancestors. Tracing Your Westmeath Ancestors. The Irish In India. Discover Irish Genealogy Directory Sources In The US. Ships To Far Shores - Exploring Passenger and Naval Records. Unique Photographic Record Of Dublin City Now Online. Thinking Of Starting A Graveyard Project - Read The Essential Information You Need To Know Before Commencing. A Wexford Colony In Brazil - The Irish Legacy. Books Ireland. What's New Review - Keep Up To Date With The Latest Record Releases Available To Help With Your Research. Irish Ancestors In Australasia - This Issue Looks At Irish-Australian Judges, Magistrates & Lawyers. Letters To The Editor, News From The World Of Irish Genealogy And Lots Lots More!